Be the first to share your favorite memory, photo or story of Carla . This memorial page is dedicated for family, friends and future generations to celebrate the life of their loved one. 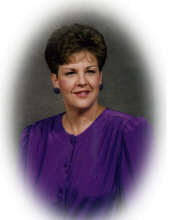 Carla Sue Bailey 63, of Tuscumbia,AL, died Friday, October 19, 2018 at Hellen Keller Hosptial, Sheffield, Alabama. She was formerly from Huntsville, AL for over 40 years and lived in Tuscumbia, AL for the last two years. She was a member of the Highland Park Baptist Church. She loved her grandchildren and high school classmates. She enjoyed watching her family play sports and was a proud patriot. She was born Sunday, November 14, 1954 in Anchorage, AK. She was the daughter of Jimmy Joe Hilton and Phyllis Jeanne Langkeit. She is survived by her parents: husband, Tommie Lee Bailey, Tuscumbia, AL; sons, Brett Bucher, New Market, AL, and Travis Bucher, Fort Campbell, KY; daughter,Taryn (Brett) Pitman, Muscle Shoals, AL; brother, Dr. Myron Hilton, Oklahoma City, OK; sister, Narda Hilton, Bristow, OK; grandchildren, Clay Pitman, Noah Pitman, Abby Pitman, Turner Bucher, and Trevor Bucher; and a host of nephews and nieces. A visitation will be held on Wednesday, October 24, 2018 at Ardmore Chapel Funeral Home, Ardmore, Alabama from 10:00 AM until 12:00 PM. The Funeral Services will be held on Wednesday, October 24, 2018 at Ardmore Chapel Funeral Home, Ardmore, AL, at 12:00 PM with Pastor Brett Pitman officiating. Burial will be in Gatlin Cemetery, Ardmore, AL. To send flowers or a remembrance gift to the family of Carla Sue Bailey, please visit our Tribute Store. "Email Address" would like to share the life celebration of Carla Sue Bailey. Click on the "link" to go to share a favorite memory or leave a condolence message for the family.